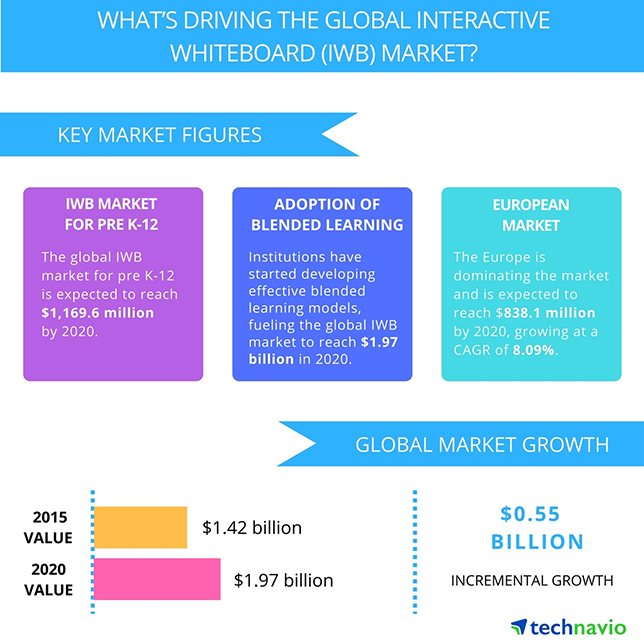 The research study covers the present scenario and growth prospects of the global IWB market for 2016-2020. To determine the market size, the study considered revenue generated from the pre-K–12 and higher education sectors of the market. The pre-K–12 segment of the IWB market was valued at $816.2 million in 2015, the report states, and is forecast to reflect a CAGR of 7.46 percent through 2020. Blended learning is credited in the pre-K–12 segment as a main reason for increased adoption of IWBs. The emphasis on developing the cognitive skills of students during formative years has played a crucial role in encouraging teachers to explore these technologies, the report says. Enhanced compatibility with digital content. Key vendors in the market include BenQ, Samsung, Seiko Epson and Smart Technologies. Other prominent vendors include Interphase, Ipevo, Luidia, Mimio, Sharp, LG Electronics, Panasonic, Julong Educational Technology and Vestel. This latest Technavio report contrasts starkly with a study published earlier this year by Future Market Insights, which predicted that the global IWB market would decline at a compound annual rate of 17 percent from 2016 to 2026. The Technavio report mentions IWB software such as iBoardTouch, which offers features such as annotation, highlight and edit; and spotlights the vendor Luidia, which has developed cloud-based interactive tools which teachers can use remotely. A sample of Technavio’s report can be obtained by visiting this site, which asks for some basic identification information.